The award-winning, "Clouds Over Sidra" a virtual reality film that was released in January of 2105, was one such film. It follows a twelve year-old girl named Sidra in the Za'atari camp in Jordan -- currently home to an estimated 84,000 refugees from the Syrian civil war. The groundbreaking film shot for the United Nations using the Samsung Gear VR 360-degree platform, is the first ever film shot in virtual reality for the UN and is designed to support the UN's campaign to highlight the plight of vulnerable communities, particularly refugees. Since the success of "Clouds Over Sidra" there has been some buzz on how nonprofits and global development organizations might be able to leverage virtual reality to build awareness of their causes. One such organization taking on virtual reality is Trickle Up. Trickle Up is a global poverty alleviation organization that works with the world's poorest and most vulnerable people to help them achieve financial independence and social connection. I spoke with Tyler McClelland, Trickle Up's Communications Officer, to learn more about what the learnings, challenges, and best practices were for them as a smaller organization, taking on VR for the first time. What made Trickle Up decide to try VR? Trickle Up works in some of the poorest and most remote places on earth and for most of our supporters, making the journey to visit our participants and get a feel for their lives just isn't possible. But when it is possible, the experience is overwhelmingly powerful. This past April, I had the opportunity to travel to Guatemala and visit a group of women living in small communities on the mountains outside of Tamahú. Being steps away while they engaged with customers in shops they'd built--some of which were the first markets in their communities, really imparts a great appreciation for what they've accomplished. Being in their space and experiencing their lives, even briefly, made me understand their circumstances in such a visceral way. I was able to form a human connection, and that's difficult to translate when you're stuck behind a screen. When I returned from Guatemala, I was so inspired by the women I'd met and was thinking of ways I could bring what I'd experienced to our wider audience. At the same time, VR was starting to be embraced by humanitarian organizations and the media, like the UN and New York Times. I watched one now-famous example, Clouds Over Sidra, and was surprised by the amount of empathy I felt for Sidra just by being transported into her world through my smartphone and some cardboard. It was eerily similar to the feelings I had when visiting Olivia Chiquin in her shop outside Tamahú. If there was ever a 'light bulb moment,' that was it. I knew we had to find a way to transport people into Olivia's world. Walk me through Trickle Up's VR planning process. Trickle Up holds an annual fundraising gala where we feature videos from the field to showcase our work to some of our biggest supporters. For me, this seemed like the perfect opportunity to try doing something like VR, since we're always trying to think of new ways to bring our work to life for our guests. The first step, and it's an important one, was to ensure internal buy-in from management and my team. It was critical to have everyone on the same page from the outset and have a clear idea of our objectives and a general outline for the content. After that, it was a matter of identifying a creative and production team. We have the great privilege of being blown away every year by the talent and generosity of our friends at Bodega Studios, a production company here in New York, who donate their time and energy to create stunning videos for the event. The planning process for the project really started in a creative brainstorm with them. It was critical to have the support of creative and engaged thought partners at that early stage, to both rein us in and encourage us to let our minds wander a bit in terms of the possibilities. Since VR was a bit of an experiment for both of us, we decided to focus on the immersive qualities it offers and create a series of brief experiences where viewers could be dropped into the lives of Victoria and Selvin Tiul, a family in northern Guatemala, and join a savings group meeting with Las Azucenas, one of our longest-standing groups. In February, the crew from Bodega met up with our field team in Guatemala and literally climbed a mountain to capture these experiences on film. The final piece of the puzzle was deployment: How were we going to distribute the VR pieces? We needed a couple of components to get our VR content out there: a hosting platform and a printer who could print Google Cardboard glasses. 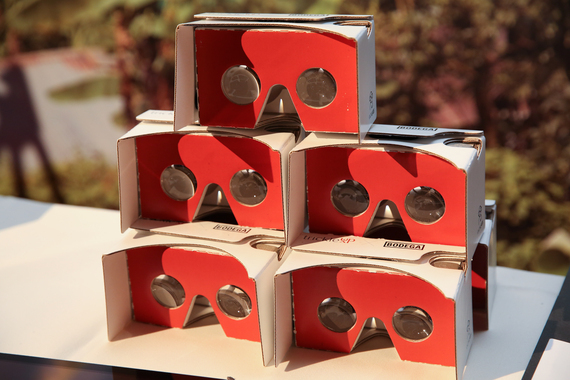 There are several companies who host VR content, including YouTube 360, and several companies who print cardboard glasses, which can be found on the Google Cardboard website. We found a company who could actually do both the printing and the hosting, which was ideal. Once we had the glasses printed and the content online, we were ready to deploy. At our gala, we set up a booth with trained staff and volunteers to demonstrate and help guests experience the videos. Having VR at the event generated a lot of curiosity and excitement. How did you determine your logistical requirements and what vendors to use? The best advice is to do your research, and be clear about your objectives, needs, and resources. We knew we wanted to deploy our VR at an event, offer it as an incentive for donors, and to promote an upcoming Americas campaign. Like most small nonprofits we don't have a large communications or marketing staff or budget, and knew we would need to find vendors to tackle various parts of the project including the production of the VR videos, hardware, web hosting, and a distribution platform. And, there were additional considerations because we were launching at an event. We needed staff and volunteers to be trained on the technology so they could show guests how to use it, drum up enthusiasm, and troubleshoot during the night. We decided to rent a number of iPads and iPhones for staff to use to demonstrate during the cocktail hour, and we needed to work with the venue to ensure we could access enough bandwidth to stream the content. Logistically, our pro bono team at Bodega Studios handled all the creative, shooting, editing and sound, and the VR content can be viewed on a phone, tablet or computer. One of our main objectives was to create an immersive experience, so we decided to print cardboard VR headsets so that viewers would have the feeling of being in Guatemala with Trickle Up participants. The headsets were also a fun take-away and allowed viewers to use their smartphones to view the content anytime, anywhere after the event. Google hosts a website for Google Cardboard which features a number of certified vendors who can print branded headsets. We chose a company to print our cardboard glasses who also offered to host the VR content and provided a direct link to a Trickle Up branded page on their website, which eliminated the need to download an app for viewing. For me, this was the perfect solution because it eliminated a barrier to participation--having to download another app to your smartphone--and solved all of our distribution needs. But there are companies that offer all these services separately, so it's easy to build a solution that suits your objectives. And one final thing: When you're on a tight budget, don't be afraid to negotiate. In an emerging medium like VR, how did you approach storytelling? VR is still such a nascent medium, I think most storytellers are still figuring out how to put its unique evocative qualities to use. Through the traditional videos, we're introduced to Victoria and Selvin Tiul, and women from the Las Azucenas savings group, and hear them tell their stories. Then we offered the VR pieces as a way to immerse you in their world. You can visit Victoria in her home, watch Selvin doing chores in their yard, and sit in the middle of a savings group meeting with Las Azucenas. The VR pieces are like little time capsules where you can drop in and experience that moment in time with the women in our program. But as the technology becomes more ubiquitous, storytelling will necessarily become much more central to VR. The possibilities of telling a story to someone in a 360-degree environment is fascinating and challenging. I love it because unlike traditional storytelling, which often relies on a passive audience, it empowers the audience to be actively engaged. That's something that's very much in line with Trickle Up's values. You launched your VR experience live at an event. What challenges did you face? Deploying the technology was a big challenge because many people are still unfamiliar with VR. We had to ask ourselves plenty of questions: How can we make the videos as easy to view and accessible as possible? How do we account for the varying levels of comfort with technology of our guests? How can we ensure the experience is safe? How do we build enthusiasm for the content without jeopardizing the other objectives of the evening? Ultimately, we had to make a few choices: Since the VR content was a companion to the video pieces and because we wanted to give our guests the chance to "opt-out", we decided not to have a shared moment during the program, which was something we had considered. Instead, we set up a booth at the cocktail hour to generate excitement for the rest of the evening. 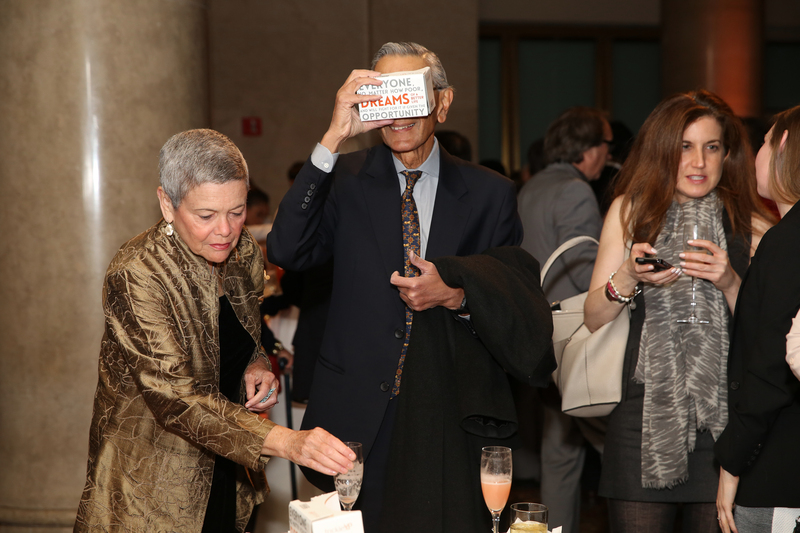 The cardboard glasses were available to take from the booth, and a few pairs were distributed at each table for guests to use during dinner. We also decided to rent iPhones and iPads for staff and volunteers to demonstrate with, and for guests to use at the booth instead of their own devices. In addition to staff and volunteers being trained to assist guests, a portion of the printed program at every table setting was devoted to instructions for use. We also decided to purchase extra wifi at the venue to support streaming the content. And the greatest challenge was the display and streaming. VR videos are extremely heavy and require advanced graphics cards (think iPad 3s and above--iPad 2s just won't work, trust me), and a colossal amount of wireless bandwidth to stream simultaneously. So, of course there were a few questions I wish we'd asked ourselves: What technical specifications are necessary to run the content on an iPad or iPhone? How much bandwidth will be necessary to stream VR content? But we didn't, and had to make a few last minute decisions and call in a few favors to get iPads that could handle the VR and add a little extra to our budget line for wifi. It was certainly a learning moment. Producing VR can be a significant commitment, how did you ensure it was worth the investment? From the beginning we knew the content would need to be evergreen, serving multiple purposes for our external communications and fundraising. 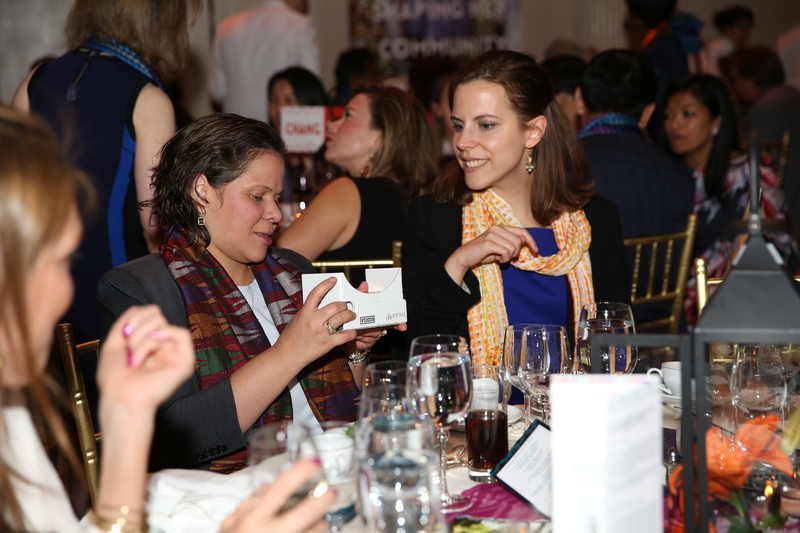 We deployed the VR experience at our annual gala, which injected the night with energy and enthusiasm that was well worth the investment--we were able to bring key supporters on one of our most important nights closer to our work than we've ever been able to before. Introducing them to Victoria and Selvin Tiul and the women of Las Azucenas in this way was a first for us, and such a memorable experience. In coming months, we will also be offering the Trickle Up Google Cardboard headsets, along with the video and VR content, as a special reward for donors who sign up to make automatic monthly gifts, and to promote a new campaign to grow our impact across the Americas to reach hundreds of thousands of more families like Victoria and Selvin's. Last words of advice on what a nonprofit should know before venturing out into the brave new world of VR? The most important thing you need to start venturing into the world of VR is to do your research. There's an ever-growing amount of VR content in the world--watch it, get a grasp of the possibilities, and think about how it can best serve your organization's objectives. And be clear about your objectives. Spend some time researching vendors so you can make an informed decision about who and what combination is right for your objectives and your budget. (And as I mentioned, don't be afraid to negotiate.) Get internal buy-in from management and your team because having clear expectations from the start is essential to a smooth production process and especially important when taking on a new media form like VR. There will be lots of questions, and thanks to your research, you'll have (most of) the answers. 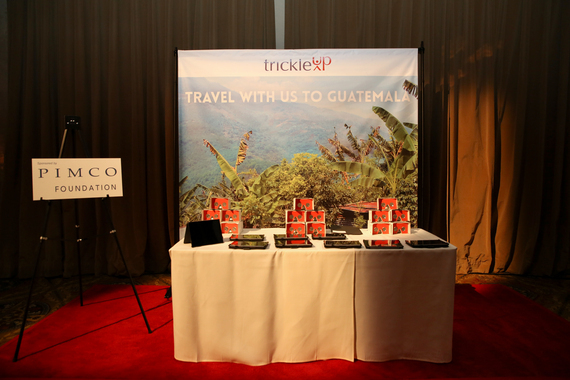 To view Trickle Up's virtual reality films, click here.